Can You Trust Your Children With Your Trust? Creating a trust quite literally means trusting someone to administer the trust’s assets in accordance with your instructions. Many Florida residents trust their family members to serve as faithful trustees. But unfortunately, there are cases where a family member breaches their duty to the trust–and other family members–and misappropriates the trust’s assets for their own benefit. A recent lawsuit filed in Miami-Dade County, Brown v. Altman, illustrates the types of trust administration misconduct that can lead to litigation. It is critical to emphasize that a lawsuit is simply a statement of allegations and not a formal finding of fact or law by the court. The discussion below of this lawsuit is for informational purposes only and should not be taken as an endorsement of any party’s positions in the case. The lawsuit revolves around a trust created by a now-deceased man in 2005. (We’ll refer to him as the grantor.) When the grantor died in 2005, his two adult children and estate planning attorney assumed control of the trust as co-trustees. The trust itself required that any income from the trust be paid to the grantor’s wife, for the rest of her lifetime. The wife also had the right to withdraw the greater of $5,000 or 3 percent of the trust principal each year. Upon the wife’s death, the trust would be dissolved and distributed to the grantor’s children and grandchildren. The lawsuit’s core claim is that the grantor’s daughter stole money from both the trust and her mother to fund the purchase of several massage franchise stores. The lawsuit alleges the daughter “offered to assist her mother with paying her mother’s monthly expenses” and to act as her bookkeeper. The mother agreed to this arrangement and opened a joint checking account with her daughter. According to the lawsuit, the daughter “almost immediately began to steal funds from the Joint account.” The daughter and her husband also allegedly used the mother’s personal assets as “collateral for a loan” to finance the massage business–and then used trust assets to actually pay back the loans and other business expenses. The lawsuit further claims the daughter admitted to her actions in a “series of emails and texts” to the mother and other family members. And in addition to the daughter, the lawsuit names the attorney co-trustee, the daughter’s husband, the massage business, and the brokerage that manages the trust’s assets as co-defendants. The third co-trustee, the grantor’s son, is a co-plaintiff together with his mother. The daughter has publicly denied the allegations in the lawsuit. She and her husband filed a motion to dismiss the case, which remains pending before a Miami-Dade Circuit Court judge. When creating a trust, you need to think long and carefully about who should serve as trustee after your death. 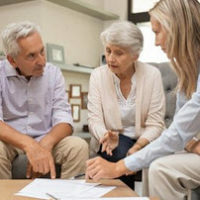 If you have any reason to suspect that members of your family might not be up to the task, you should strongly consider hiring an outside professional fiduciary. And if you need further advice or guidance on this subject from a qualified Fort Myers estate planning lawyer, contact the Kuhn Law Firm, P.A., at 239-333-4529 today to schedule a free initial consultation.